This is your chance to take a gentle stroll and be inspired! Even when it is teeming with rain, the Glacier Valley is still a place of isolation, wonderment and awe. Anyone with sensible shoes and a basic level of fitness can complete the round trip in 1 hour 30 minutes. Most of the glaciers that have made the area famous are molten rivers of silver and white on the horizon. 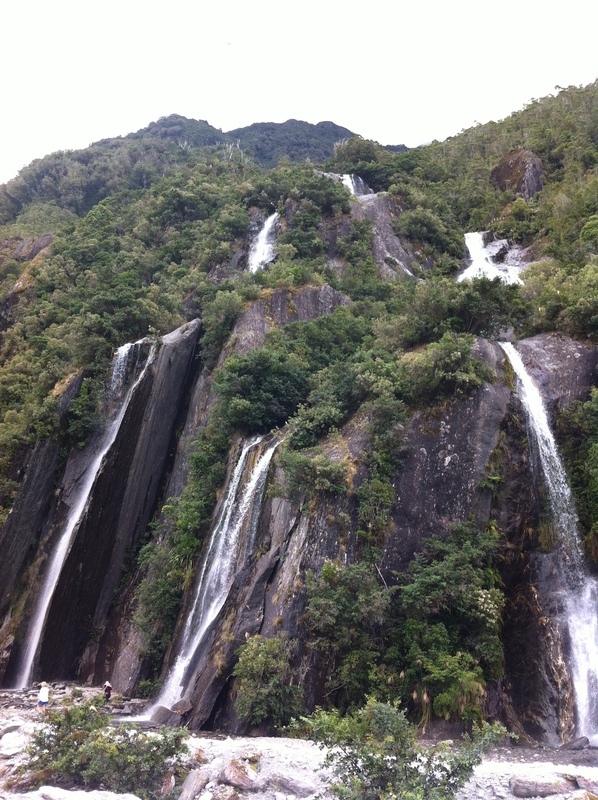 However, the Franz Josef and Fox Glaciers are the exception not far from the West Coast Road, State Highway 6. Head south from the Franz Josef Glacier Village and cross the one way Bailey bridge over the Waiho River. 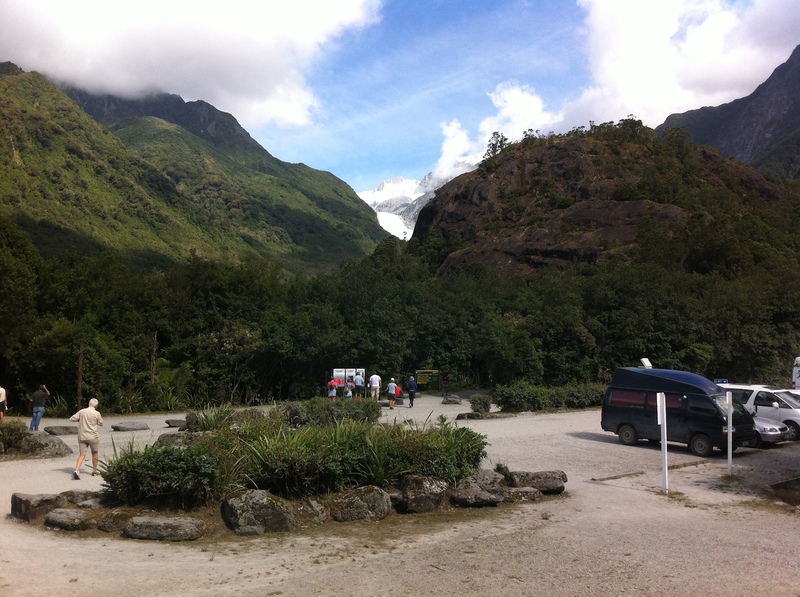 Turn left up the Franz Josef Glacier Valley Access Road and continue to the Glacier car park at the end of the road. If you do not have a vehicle, you can also catch a shuttle or cycle to the car park. Look out for the kea and New Zealand falcon which occasionally visit the area. The track to the first viewpoint is wide and carefully graded. It is known as the Forest Walk and starts at the car park about fifty meters from the public toilet. When you reach the Forest Walk Viewpoint take some time to read the informative interpretation boards on glaciology and the history of the area. You can also catch your first glimpse of the Franz Josef Glacier Ka Roimata o Hine Hukatere. You are still over one and a half kilometres from the terminal face. You can just begin to understand the enormity of the glacier itself. From this point, the blue ice looks like polished marble. You can begin to see the crevasses where the dynamic flow of ice has literally been ripped apart. The precipitous rock walls that flank the glacier are over one kilometre high and create an optical illusion that the terminal face is not very high. 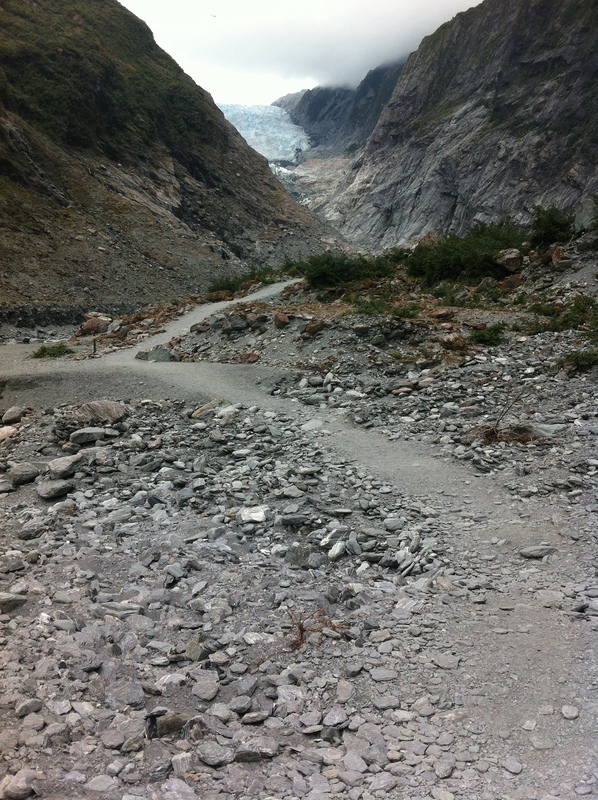 If the weather conditions are poor and the Glacier Valley is flooded the trail may be closed at this point. Please read all signs carefully and do not go past the barriers. If you have any questions please visit the Department of Conservation Visitor Information Centre in the Franz Josef Glacier village. Beyond this point follow the trail up the Waiho riverbed. The first significant waterfall is called Trident Falls and is an excellent photographic opportunity. Further up the valley, Split Apple rock lies on the valley floor near Champness Rock. If you look up to your right, you can see the original location of this schist boulder high on the cliff face. At the last set of barriers the terminal face of the glacier seems monstrous, and you can not help but feel a sense of insignificance. The fact that this point is less than 300 metres above sea level and is one of three glaciers in the world this close to the coastline is remarkable on a world scale. The glacier is unstable and constantly changing, especially during wet weather. You must stay behind the barriers and observe safety signs at all times. Eighteen thousand years ago the Franz Josef Glacier/Ka Roimata o Hine Hukatere stretched to the sea and beyond. A slight increase in atmospheric temperature has meant a glacial retreat on the West Coast over the years with periodic and short-lived advances. The Maori name for the glacier is Ka Roimata o Hinehukatere ('The tears of Hinehukatere'). The legend of the Makaawhio people (a sub tribe of the Ngai Tahu) says that Hinehukatere was extremely strong and fearless and loved climbing in the mountains. She persuaded her lover Wawe to climb with her. Wawe was less experienced in the mountains, but enjoyed accompanying his beloved. Disaster struck when an avalanche swept Wawe from the peaks to his death. Hinehukatere was broken-hearted and her tears flowed down the mountainside. The gods froze them in the form of the glacier as a reminder of her grief. Leonard Harper crossed Harpers Pass in 1852 and then named this glacier Victoria and the Fox Glacier, Albert after the monarchs that were ruling the British Empire at the time. Sadly the nineteen year old Leonard did not formerly register this name and in 1865 Julius Von Haast named the river of ice after His Imperial Majesty Franz Josef I, Emperor of Austria. The Emperor Franz Josef gifted Westland Tai Poutini National Park one of its greatest pests. The two males and six female chamois were shipped to Wellington, taken by train to the Hermitage in Mt Cook National Park and released in 1907. As long as you hold a valid permit, the hunting of chamois is now unrestricted and even encouraged by the Department of Conservation. Hopefully eager hunters will restrict the impact that chamois are having on New Zealand's native alpine flora. The Waiho Valley is a hazardous environment. Do not attempt to cross river and water channels, which change rapidly at times of heavy rain.